Back in 2006, SHIFT Communications pioneered the first social media press release. It was super-cool, with links to other sites, shorter media snippets, recommendations for social network posting, multimedia, and more, well ahead of its time. But that was years ago; is the social media press release still relevant? In some ways, the answer might surprise you: the Social Media Press Release isn’t relevant as a standalone press release, because these days social media and earned media are one and the same. Gone are the days where you needed separate communications for someone who was in the mainstream media and someone who was a blogger. Today, if you don’t treat new media creators with the same level of access as traditional media outlets, you’re in for a bucket of relative obscurity, especially if your product isn’t especially share worthy. If social media isn’t fully and wholly integrated into your overall earned media and marketing plan, you’re fundamentally asking to be ignored. It’s not enough to put links to your Twitter account or Facebook page on your press release, or even enough to provide suggested content. Today, you must have your social network (or your PR agency must have one ready for you) prepared, with relationships built and in place, long before your press release even hits the wire. So what does the modern social media press release look like? 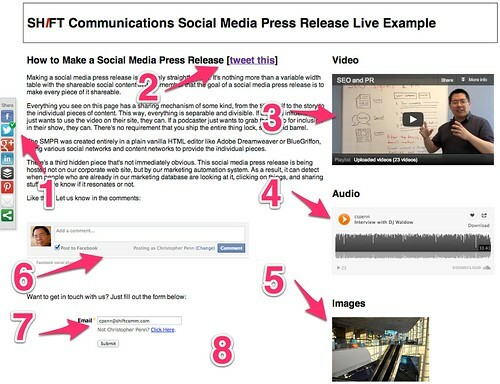 Social is now embedded in it fully and wholly, and it’s one and the same with your traditional press release. Tools for sharing have made distribution of news and media much simpler than they were in the first version, back in 2006. Most important: every piece of the new social media press release must be independently shareable! Let’s look at some of the core features of the content. 1. Simple sharing buttons have been replaced with up-to-date, modern sharing tools, many of which can be pre-configured to share specific content, or share with specific text so that your message gets out the way you intend. 2. Headlines need to be kept less than 55 characters. Why? Because you want them to be retweeted and reshared, leaving room for people to add in your Twitter handle or other social network identifier, as well as be mobile-friendly. 3. YouTube video. YouTube is the platform of choice for three reasons. First, it’s got the largest audience that loves to share if something is share worthy. Second, the YouTube player is fully mobile-compatible on many different platforms and devices, so you can be sure that your press release will be available to journalists and content creators no matter how they see it. Third, nearly every social network recognizes YouTube URLs and allows YouTube videos to be played natively on the individual social networks. 4. Mobile-friendly shareable audio. Services like SoundCloud are recommended because they’re mobile-compatible. If you checked out our mobile-friendly press release, you know why this is important. It’s also important for the audio itself to be shareable. 5. Photo gallery set. You can likely use any photo sharing service here, but Flickr is an excellent choice for its strong defense of intellectual property and high share ability. 6. Social commenting. Integrated social discussions using common plugins like Facebook Comments, Disqus, Livefyre, or other systems. 7. Selected contact information. In the first version of the social media press release, we encouraged all forms of contact info, but we now recommend you use your best judgement for what to include. If you’re not active on Twitter, don’t include a Twitter handle or you’ll just give the impression of not understanding social. 8. Invisible to you but known to the company publishing it, the entire press release is embedded inside a marketing automation system. If you’ve got a cadre of reporters, content producers, and journalists that you’ve engaged with in the past, you can see from the back-end data who has found it interesting and who has shared it. Note that this social media press release fits on one page. It’s a stock, standard HTML page that has everything embedded in it, and can be shared to other sites. Again, really important: all of the pieces of media in this press release aren’t just part of the press release alone; they’re independently shareable to social networks so that your news gets maximum exposure in as many formats as possible. Most important is what isn’t on this page, however: the network. Great content rarely takes off on its own; in order to get something shared, you need a powerful social network to distribute your content for you. Take the time to build your network, build your relationships, build your community as soon as possible so that you don’t have to try to build content and network at the same time. We hope this revision and update to the social media press release is useful to you! Click here to see the live, fully-functional version.